NOTE: Charlottesville Tomorrow is a non-partisan organization covering local elections. It did not cover 2009 elections for School Board, Sheriff, Commonwealth's Attorney, or Clerk of the Court. On November 3, 2009 elections were held in Charlottesville and Albemarle County for state and local offices and representation. Two at large seats on the City Council were contested by four candidates. Two Democrats, incumbent and mayor Dave Norris, and Kristin Szakos ran against two independents, Bob Fenwick and Paul Long. Andrew Williams also ran as a write-in candidate. Democrat James E. Brown III defeated independent write-in candidate Paul J. Best. Three incumbents, Edmund R. "Ned" Michie, Leah W. Puryear, Juandiego R. Wade ran unopposed. 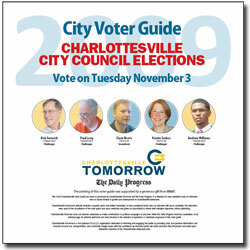 Candidates for Charlottesville's Commonwealth's Attorney, Dave Chapman; Charlottesville Commissioner of the Revenue, Lee Richards; and Treasurer, Jennifer J. Brown, all incumbent Democrats, ran unopposed. The Rio, Jack Jouett, and Samuel Miller district seats on the Board of Supervisors were up for reelection. . In the Jack Jouett District, incumbent Independent Dennis Rooker ran unopposed. In the Rio District, Republican challenger Rodney Thomas defeated incumbent Democrat David Slutzky. And in the open seat in Samuel Miller District, Republican Duane Snow defeated Democrat Madison Cummings and Independent John Lowry. 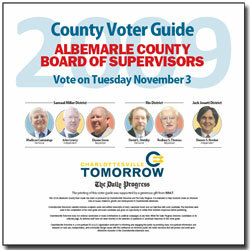 Overall voter turnout for Albemarle County in this election was 46.7%. Three seats on the Albemarle County School Board, also from the Rio, Jack Jouett, and Samuel Miller magisterial districts were up for reelection. For Virginia House of Delegates in the 57th, 58th, and 25th House Districts, which share Charlottesville and parts of Albemarle County. Incumbent Democrat David Toscano defeated Independent challenger Robert Brandon Smith III. Incumbent Republican Rob Bell defeated Democratic challenger Cynthia Neff. Incumbent R. Steven "Steve" Landes defeated Democratic challenger Greg J. Marrow. Elections will be held for Virginia's governor, lieutenant governor, and attorney general. ↑ Web. Independent Andrew Williams enters City Council race, Charlottesville Tomorrow, 13 May 2009, retrieved 15 May 2009. ↑ 8.0 8.1 8.2 8.3 E-mail. Schermerhorn, Clarice, Elections Manager, Albemarle County. "Official Results November 3, 2009 General Election.." Message to Charlottesville Tomorrow. 12 Nov. 2009. ↑ Official Results November 3, 2009 General Election. Schermerhorn, Clarice, Elections Manager, Albemarle County. "Official results." 12 Nov. 2009. E-mail to Charlottesville Tomorrow. ↑ List of Candidates, Member House Of Delegates, State Board of Elections, Commonwealth of Virginia, retrieved 18 Sep 2009. ↑ List of Statewide Candidates, State Board of Elections, Commonwealth of Virginia, retrieved 18 Sep 2009. Virginia Public Access Project - Campaign finance information about candidates, committees, donors, etc. This page was last edited on 10 October 2018, at 19:38.